The work will lead to delays during the summer and earlier closing time than normal. Normally, the road closes in early November. Under the proposed construction plans, the bridge would close October 15, 2018 several weeks ahead of its normal, expected closure time. 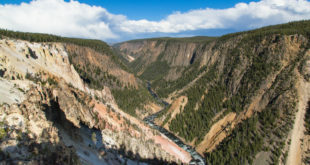 This would effectively close Yellowstone’s eastern entry as well, since Fishing Bridge is the only route connecting the East Entrance and the rest of the park. According to the Bozeman Daily Chronicle, the park is soliciting bids for the work. Yellowstone Superintendent Dan Wenk told the Chronicle he expects a contract to be in place by April 1. The work will take at least one year, possibly two. Currently, all interior park roads save for the North-Northeast Entrance route are closed. The East Entrance road/Sylvan Pass will reopen to vehicles May 4, 2018, weather pending. “We will ask them to limit it to 15 minutes,” he said. “There is very, very, very little traffic at that time of night,” he said. Park officials say the work is necessary to improve safety conditions and ensure the route does not degrade further. In addition, according to the Cody Enterprise, the NPS is also planning to build a bridge over Pelican Creek. Wenk told the Enterprise the agency does not have funding for that project, however. According to the Chronicle, Cody officials are displeased that work is scheduled during the summer, since it means visitors won’t be able to travel from/through Cody to the park as easily as other routes. Indeed, Cody officials wrote a letter to park officials last spring arguing the park should wait until the end of tourist season to start any construction. Nonetheless, the same Cody officials have acknowledged the need for road repairs on Fishing Bridge. “It’s a necessary evil to take care of the infrastructure,” Cody mayor Matt Hall told the Chronicle.